The Australian Climate change Authority has released its final assessment on what Australia's climate emissions reduction target should be. They say that the global conditions have clearly been met for Australia increasing emissions reduction from 5 per cent on 2000 levels to 19 per cent on 2000 levels by 2020. This week Alcoa announced the closure of it's Port Henry smelter and aluminium rolling mills after a review conducted in the last year. This is a definite employment blow to the Geelong region, coming on the heals of the Ford factory announced closure. But it can provide impetus to reduce carbon emissions for climate change mitigation action by shutting down polluting coal fired capacity now excess to demand. The Alcoa closure will result in a reduction of about 360MW of electricity currently supplied to the Port Henry aluminium smelter. The Anglesea coal fired power station provides 150MW of this power, which would mean a need to reduce La Trobe Valley generating capacity by about 210MW. Anima Mundi - permaculture, peak oil, climate change and the Gaia theory. For a short time my first documentary, Anima Mundi - Permaculture, Peak Oil, Climate Change and the the Gaia theory, is available to watch for free at Culture Unplugged, an online film festival. Anima Mundi is signed with a US distributor who has ripped me off, thus I have allowed the film to be shown free in their licensed territories by the festival. Click the link to watch: www.cultureunplugged.com/documentary/watch-online/play/11753/Anima-Mundi Please vote for Anima Mundi. Read more about Anima Mundi - permaculture, peak oil, climate change and the Gaia theory. The International Energy Agency (IEA) has just reported another increase in CO2 emissions for 2011 to a new record high of 31.6 gigatonnes (Gt), an increase of 1.0 Gt on 2010, or 3.2%. Last year the IEA reported a record high of 30.6 Gigatonnes during 2010, with Greenhouse gases increasing 6 per cent, one of the largest annual increases on record. Greenhouse gases increased 6 per cent during 2010, one of the largest annual increases on record according to the US Department of Energy. In 2010 about 512 million metric tonnes more of carbon was emitted to the atmosphere than in 2009. Total emissions for 2010 were 30.6 Gigatonnes, 5% higher than the previous record year in 2008, according to an International Energy Agency report in June 2011. The latest figures put global emissions on track with the worst case projections from the Intergovernmental Panel on Climate Change (IPCC) 2007 report. A University of Sydney researcher has received an award for groundbreaking work into capturing carbon emissions - research important to mitigating climate change by reducing atmospheric carbon pollution. Dr Deanna D'Alessandro, a postdoctoral fellow based in the School of Chemistry at Sydney University, was awarded a L'Oréal Australia For Women in Science Fellowship for her research on ways to capture and release carbon dioxide, hydrogen and other gases using molecular sponges. The public launch of the Beyond Zero Emissions report - Zero Carbon Australia 2020 - was delivered to an overflowing audience at Melbourne University last night. The report is one possible blueprint for acting on the challenge of climate change by converting the existing coal and gas fired carbon pollution dependent electricity generation to 100% renewables using only current technologies in ten years. Crop yields are under threat from rising carbon dioxide emissions with climate change, according to new scientific research. In a new study published in Science on wheat and the mustard plant Arabidopsis at the University of California at Davis, scientists found that increasing atmospheric carbon dioxide interferes with plants’ ability to convert nitrate into protein resulting in lower nutritional yield. Related: Koalas face starvation, extinction due to climate change | "Why don't the people get rid of the lizards?" Rising carbon dioxide will stimulate eucalypt growth, but this will entail reduced nutritional yield and higher levels of phenols which will doom Koala populations to slow death by starvation and extinction according to scientists. Other arboreal creatures like the greater glider, common ringtail possum, and common brushtail possum may also suffer the same fate. Two members of Newcastle climate protest group Rising Tide are challenging in the NSW Land and Environment Court the amount of carbon pollution emissions allowed by the coal fired Bayswater Power Station owned by Macquarie Generation. 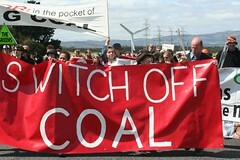 Macquarie Generation produces 12 to 15 million tonnes of carbon dioxide pollution every year.